Basic knowledge about computers is extremely important at present especially when it comes to getting a job in highly reputable industries so it is highly recommended for you to enroll in a computer skills certification course. A highly reliable computer skills course is something that you can get from Brainmeasures since this online certification and skill testing company has worked with experts in computers during the development of the course. What you can get from Brainmeasures computer skills certification course is a commendable and well-detailed computer skills training which will surely hone your skills in handling different types of computers. 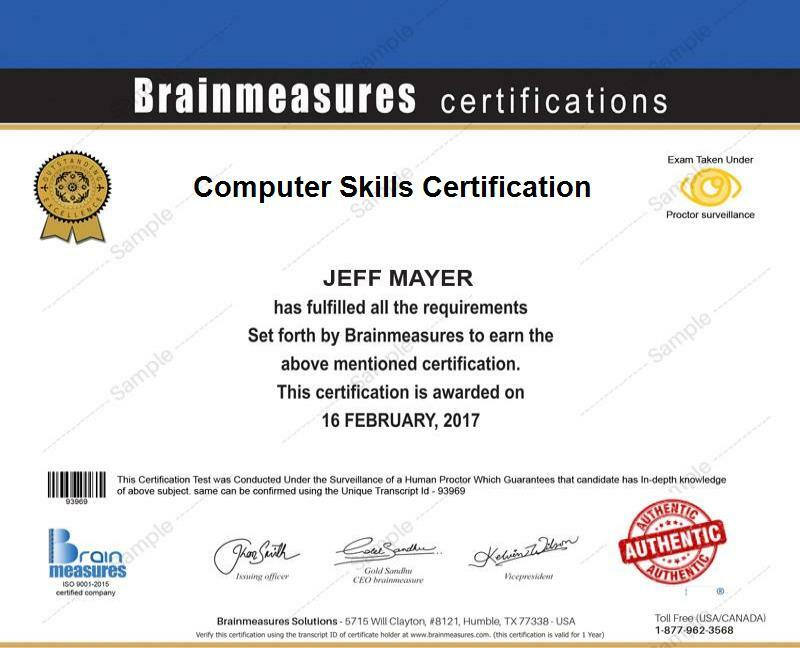 Because of the comprehensiveness of the computer skills certification program from Brainmeasures, you get the chance to compete with other computer experts and professionals in various industries after you successfully complete it. To help Brainmeasures assess the level of your computer knowledge and skills and to determine if you already deserve to hold your skill certificate, you need to take and pass the computer skills exam at the end of the program. A computer skills certification course is probably one of the most beneficial courses at present considering the fact that all business organizations and industries now are already using computers and advanced technology in their daily operations. The computer skills certification course is more beneficial for those who are still inexperienced when it comes to using computers but want to finally get an idea about how to operate them so various business organizations will start seeking their services. This is also ideal for individuals and professionals who want to survive in the automated, fast-paced and modern corporate world and for those who want to improve their career in the computer and technical industry. Completing a computer skills certification course is also a major help in further increasing your income. You can expect to earn around $48,000 to $76,000 per year if you are a computer skills certification holder. The good thing about computer experts is that their services are in great demand in both offline and online world. This means that you can also work part-time by taking up online computer skills jobs and further increase your income.